The mop head measures 17" x 6" when equipped with pad, enabling it to cover large areas in a short amount of time. The flat, rectangular pad attaches to the mop head with Velcro, making it easy to detach the pad to throw it in the laundry or switch between dry pads. We are dedicated to providing you with the best products to help you care for your valued hardfloors. We offer the best selection of microfiber mops and cloths, along with top quality cleaners to help keep your hardwood, stone, and other floor surfaces clean and maintained. 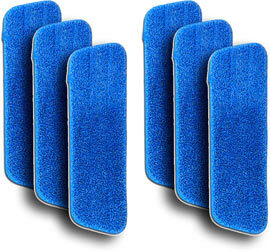 Microfiber Mops are the most effective tools for maintaining your hard floor surfaces. Unlike other mopping products which just push the dirt and dust around Microfiber Mops actually pickup and trap the dirt and dust that you are trying to remove.